Harusame House (春雨庵) was house of Priest Takuwan during 1629 for three years. The houses and garden are still remains as the original. Takuwan loved this garden and he built the same house in Edo in 1644. He made many poems, drawings, and designs when he was in this house. Now, this is one of historical assets of Yamagata. In 1629, Priest Takuwan was forced to live here by the order of Shogun. Toki Yoriyuki gave him this small houses, and Takuwan named this "Harusame an." He loved this small houses. So, when he allowed to go back Edo , he was given Tokaiji Temple by Tokugawa Iemitsu, the 3rd Shogun. 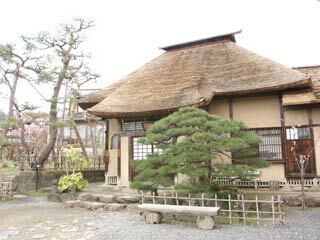 In 1644 he built new house like this Harusame House in Tokaiji and also named it Harusame an.